If you love quality horror films, this streaming service is worth the price of admission. Movie-streaming sites are like used bookstores (or if you’re old enough to remember them, the video-rental stores of the VHS and DVD eras). If you go in with a specific title in mind, the odds are it won’t be there. But if you go in and start browsing the inventory, you’ll likely find some interesting treasures. Complex corporate deals and copyright issues beyond common understanding prevent any one service from being a superstore hosting every conceivable title. So what’s the alternative to the “used bookstore?” Easy: the “specialty store” that focuses on a particular genre instead of trying to cover everything comprehensively. We’ve previously covered the high-brow film service Fandor, the documentary-film service CuriosityStream, and the independent-film champion Indiepix. Now we’ll weigh in on AMC’s Shudder, which specializes in the genre of horror. I’m a fan of horror films and have spent many, many hours watching them and writing about them; certainly anyone who doesn’t like horror films will find very little to care about here. But even as a self-professed “expert” (or, at the very least, something slightly beyond amateur), I was impressed by the range and quality of titles Shudder offers, even though their current library consists of less than 400 movies. (I estimate that I’ve seen only about 100 of the available movies, and found a couple of dozen I wanted to see.) The price is excellent, much lower than either Netflix or Hulu: just $4.99 per month (or $50 per year). 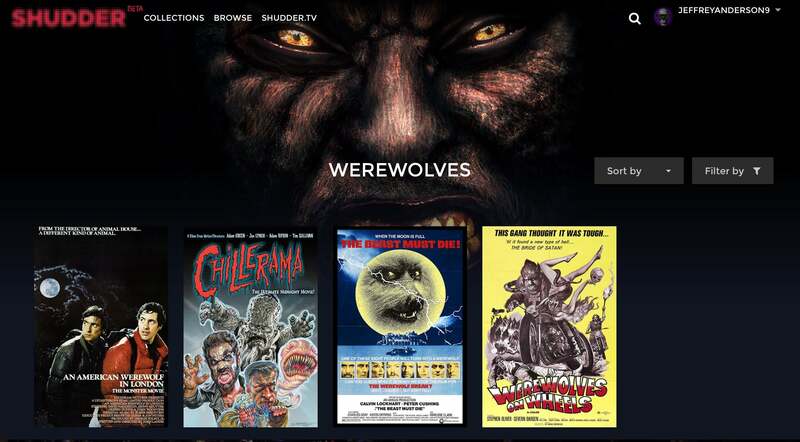 Subscribers can view Shudder's inventory of films by genre, including the type of monster featured in the film. I think that what impressed me the most is the unique “Shudder.tv” option, which allows anyone—even non-members—to simply tune into an endless stream of horror films. Though the site does tell you the title of the movie that’s currently on, you never know when a movie is going to start or end, and you don’t know what’s coming next. But that’s part of the charm. It’s almost like the old days of cable TV: just turn it on and see what’s playing (as of this writing, it’s a 2006 movie called Cold Prey, from Norway.) There is a warning of graphic content, which is useful for parents who are keeping an eye on their kids, and for kids who are trying to sneak in a subversive viewing. As for the selection, Shudder won my heart right away with a generous selection of Italian horror films, including a dozen from Mario Bava—my favorite, Kill, Baby... Kill! (1966) among them—a half-dozen from Lucio Fulci (including the must-see The Beyond), and a few more by Dario Argento. At the other end of the spectrum, the site offers plenty of cheeseball silliness that used to decorate the back shelves of video stores in the 1980s, movies like David DeCoteau’s Sorority Babes in the Slimeball Bowl-O-Rama (1988), which speaks for itself, Larry Cohen’s killer ice-cream movieThe Stuff (1985), and Troma titles like The Toxic Avenger (1984). There are also newer cult items like the brilliant Tucker & Dale vs. Evil (2010) and the astoundingly awful Birdemic: Shock and Terror (2010). 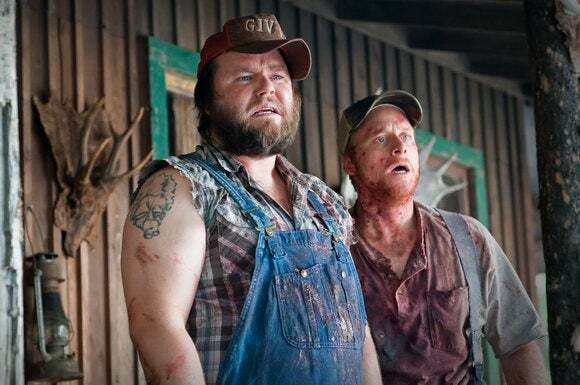 If you haven't seen Tucker and Dale vs Evil, stop what you're doing and watch it. Right now! There are art-house movies, ranging from a fine collection of Asian horror movies—the great Audition (1999), the incredibly spooky Pulse (2001), and the amazing monster story The Host (2006); plus A Tale of Two Sisters (2003), Carved: The Slit-Mouthed Woman (2007), I Saw the Devil (2010), and Marebito (2004)—to other imports like Dead Snow and Trollhunter (from Norway), Let the Right One In (Sweden), Sheitan, Fear(s) of the Dark, and Trouble Every Day (France), Heartless and Severance (England), Nosferatu the Vampyre (Germany), Timecrimes (Spain), and more. The site also offers respectable—if disturbing—movies like Lars von Trier’s Antichrist (2009), and even documentaries like Nightmares in Red, White and Blue: The Evolution of the American Horror Film (2009) and Room 237 (2012). The latter doc is about the weird theories surrounding Stanley Kubrick’s The Shining (which is not on Shudder, incidentally), and the former—which I recommend to non-horror fans—is an interesting thesis about how horror films tend to tap into the moods of their times. You'll find plenty of twisted Asian films in AMC's archives, including The Audition. The usual free, public domain stuff is here, but Shudder hasn’t bothered with the bad ones. Their choices include: The Cabinet of Dr. Caligari (1919), Carnival of Souls (1962), Night of the Living Dead (1968), Night Tide (1961), Nosferatu (1922), Spider Baby (1964), White Zombie (1932), and other classics. The site, curated by horror aficionados Sam Zimmerman and Colin Geddes, and backed by AMC Networks (producers of Mad Men and Breaking Bad), avoids tons of junk, remakes, lazy sequels, or movies that were simply designed for a quick, opening-weekend profit only to be discarded and forgotten. Instead, the curators have put together several categories and lists for fans to dig through. There are genres (“body horror,” “creature features,” “documentary,” “extreme,” “gothic horror,” “horror comedy,” “killers,” “paranormal,” “psychological thrillers”) as well as types of monsters. How well does the site actually work? I checked out a movie I’d been wanting to see called We Are Still Here (2015), a kind of paranoid ghost story featuring cult stars Barbara Crampton, Larry Fessenden, and Lisa Marie. I played it on the Shudder app on my tablet, on my laptop, and on my smart TV and had no problems; it was a very enjoyably unsettling experience. But I discovered the site’s first major flaw. Though the option to turn on subtitles or captions has been provided, it does not work. Foreign-language films have subtitles, of course, but for those of us who like to watch late at night with the volume low so as not to disturb others in the house, we’re out of luck. You'll find lots of out-of-the-mainstream fare on Shudder, including the disturbing We are Still Here. Another flaw is the inability to build a queue, but there is a way around that. Simply click on the movies you’d like to see, and let them play for a moment, and then they will appear in your “history” just below your login information. Otherwise, the site is beautifully designed, with little “shuddering” animations on the links and moody, zooming artwork, as well as well-written blurbs, quotes, and little horror-related jokes here and there. (“Stalk us on Facebook, Twitter, etc.”) Users can rate each movie from one to five “skulls” and give comments (which mostly seem thoughtful and above-board; very few trolls, so to speak). 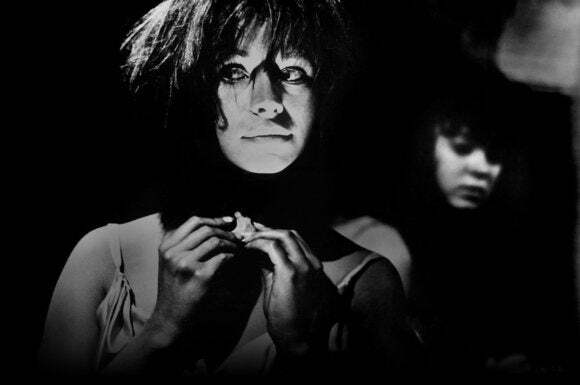 Recently, the site has asked horror filmmakers to curate their own collections of five films each. Karyn Kusama, whose excellent The Invitation is currently in release; Robert Eggers, whose The Witch is probably the best horror movie of the year so far; and Alexandre Aja (High Tension) each choose five interesting films to recommend, with a little written blurb as to why. This lends even more credibility to a site that already succeeds on many levels. It’s so good, it’s scary. 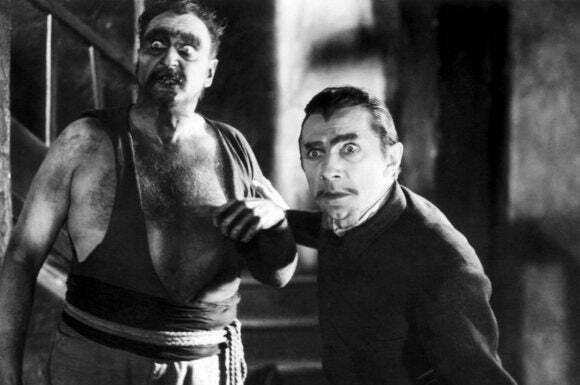 Shudder has a deep well of classic horror films, including the Bela Lugosi feature White Zombie. George A Romero’s Day of the Dead (1985), the third of his six zombie films to date. Although the superior original is here, this one is rather under-appreciated, with its underground bunker setting, oppressive military presence, and the unforgettable “trained” zombie Bub. Mario Bava’s Kill, Baby... Kill! (1966), probably Bava’s spookiest and most atmospheric movie, demonstrating his unique and masterful use of color for different emotional states and nightmare logic. In it, a doctor arrives in a small village to perform an autopsy, but finds the townspeople living in fear of a ghost girl. If the title, Spider Baby, isn't enough to grab you, seeing Lon Chaney Jr. in the credits should. Tomas Alfredson’s Swedish-language Let the Right One In (2008) is an adaptation of John Ajvide Lindqvist’s novel, and one of the best and most unusual vampire movies of recent years. With an extremely moody, dreamy style, the movie tells the story of a friendship between a strange, outcast young boy and a vampire girl. Stuart Gordon’s Re-Animator (1985) starts by blatantly stealing the music from Hitchcock’s Psycho and gleefully continues by turning H.P. Lovecraft’s story into a shocking, hilarious splatterfest. Glowing green tubes of goo, hideous zombie cats, and murderous severed heads make this cult classic worth several viewings.